By Ahmed Bilal on December 2nd, 2008. There has been a change in one of the awards – Premiership Talk has been dropped from the Best British Blog category and has been replaced with Republik Of Mancunia. This is NOT anything personal against Brian or Premiership Talk – however there is irrefutable evidence that some of his friends from college have been vote rigging (i.e. repeat voting) and we’re not going to allow cheating, intentional or unintentional. 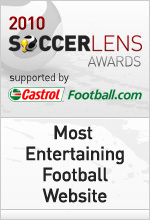 Premiership Talk is still in contention for it’s three other award categories. This was a difficult decision to make but one that was instantly clear once I saw the traffic logs and voting patterns. Readers, Blog owners and friends of blog owners, please refrain from cheating, you can most likely win without it.